There are only two things that make us happy - dopamine and serotonin. But there are millions of things which release these hormones. Happiness is only one of many emotions which we feel during the day. Some of them positive, some negative and some very puzzling. Fortunately, developers took care of it and created a wide range of mood track apps to make our lives easier and a little bit less confusing. Of course, we can create a similar app, but a development of an app is just a start. What is much more important is to retain users and encourage them to open your mood tracker app over and over again. What is a mood tracker app? Before we start talking about the main and the most important part of our article - how to retain users and make them loyal, lets consider what mood tracking apps are. A mood tracker is an app which works like a diary. The app records symptoms, analyse them and stores. Most of such applications provide users with reports, like tables and graphics, based on the collected and processed data. This data helps see the tendencies in users behaviour. It also gives a mood tracking app an ability to offer various scenarios which, as believed, can improve users mood and a general state of health. They all have very different functionality, but also have something in common. For instance, they offer various symptom rating tools, like smiles, marks or bars. They also usually have some social features, like share your mood or meditation results with friends or invite friends. Almost all mood trackers have tracking and reporting options. And, of course, they recommend users take some actions to improve their moods, like meditation, music or something else. If you want to know how much your app will cost. Here's a free accurate calculator for it from Cleveroad! As weve already mentioned, there are three main types of mood trackers, lets take a look at them according to these types. Let us start with manual mood tracker apps. Here, a user has to put all information about his or her fillings and emotions manually. iMoodjournal is one of the best examples of such applications. iMoodjournal was included into the top 9 Best Android apps 2015 by TechGyd. It is an app that has everything you need. One of the major difference from similar applications is that it helps build links between actions or event and users mood. The application gives you an opportunity to note your thoughts and emotions with the help of mood colour bar. You can also set reminders, see the history of your mood changes in an animated way. Link your life events with emotions using hashtags, share your mood in social media. The app builds multiple graphics depending on the hours of the day, or the day of the week. The second type of such apps is an app connected to wearables. To use it you need a special device that tracks your heartbeat and breathing. 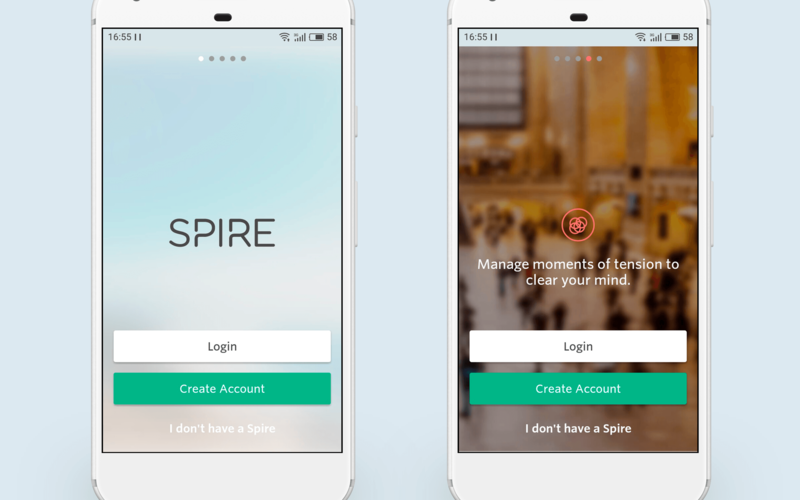 One of such applications is Spire. This mood tracker app is connected to a wearable device which monitors when people feel stress and have increased heart rate and heavy breathing. In such cases, it informs a user that he or she needs to relax. The app notifies users if they need to distract and if they dont breathe deeply enough. It also tracks users activity, counts steps and if they sit for too long. As well as that the app offers a range of meditation scenarios to relax during a day. The last type is meditation app. They also help you to control your mood and be relaxed when it is needed. One of the brightest examples is Calm. 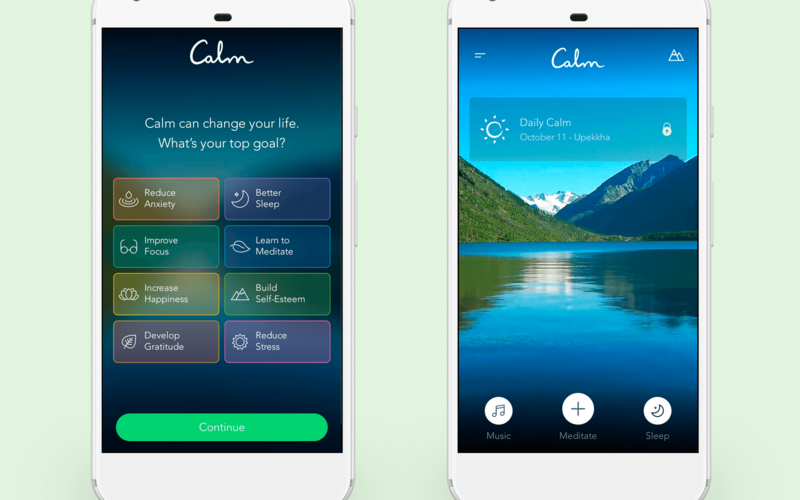 Calm is an app with hundreds of meditation scenarios and for beginners and for advanced meditation guru. You can choose not only the level of complexity but also the length of session which could take from 3 to 25 minutes. Moreover, there are meditation for all occasions. 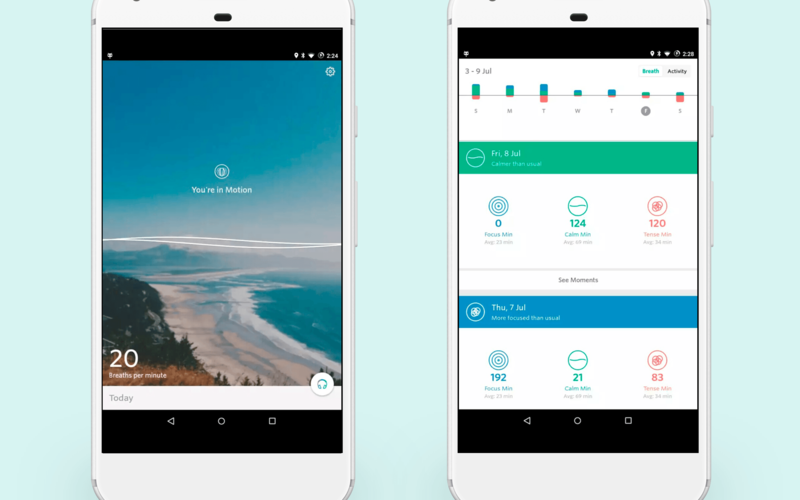 App also helps track users progress and improve meditation skills. As a bonus all meditations are divided into simple daily programs. There are also sleep stories which helps a user fall asleep faster, breathing exercises and relaxing nature sounds. No matter what type of application you are eager to create, the most important is how you are going to keep users. We have combined all the best practices and the latest approaches to help you decide what strategy to apply developing a successful mood tracking application. The idea isnt new. But it provides food for thoughts. Make innovations work for you. A win-win situation is to choose the most popular technology and apply it to make a daily mood tracker app more interesting and catching. As an option, you can add a chatbot to your application. A bot could work as a therapist giving encouraging advice. If you read our previous articles about chatbots you should remember that there are two types of chatbots, a bot that uses canned answers and a bot that works with the machine learning technology. With such a delicate application that has to improve peoples mood and mental health the developer has to be super careful writing canned answers for the bot. The advice must be useful but gentle recommendations. If you aren't very familiar with the concept of Chatbots, then you should watch this short video about them. If you choose to develop a chatbot with machine learning technology then it would be necessary to inform users about it, notifying that the system will get better with time and the more they communicate with it the better tips chatbot will give eventually. A chatbot implementation could give you lots of benefits to a track your mood app. It would be fun for users to communicate with a machine. If the system is good enough they will not only come back to it over and over but also would like to recommend it to their friends. There are lots of people (especially teenagers) who find it difficult to share their emotions and experiences even with family and friends. Chatbot can listen to them, give some advice and will never judge so its a perfect conversationalist to talk to. A chatbot can track words of word combinations which are signalling about depressions or even worse mental health problems. In such instances, a system could offer a person to connect him or her with a specialist or warn relatives of a user about a problem. This is the main point you need to concentrate at. Think what problem your app will solve. It has to be a real issue and your app will have to offer a great solution. We may assume that people who download a mood tracking app are likely to feel stress and anxiety or they are just curious. Anyway, we understand that the majority of all users need the app to monitor their mood and improve it, of course. To help them with monitoring a machine learning technology could be applied. Using this approach users will not only see the analytics but also understand the dependence of their mood on different factors. Along with that, the program will choose the best practices to lift mood or calm down or cheer up a user based on personal preferences which system memories. Still believe you can't use Machine Learning technology for your business? Not true! here are some options to apply the technology in real life. For instance, some users feel better after an anecdote, some after a favourite song and other after a meditation. The system interacts with users and memorizes their choices. After some period of time the system knows what is better to offer to make a person feel better. It is a fact that 1 in 4 people delete an app after one use. Almost 80% of users will give an app a second chance and only 16% would open it in a third time. What we can do here is to show people a goal, explain why your mood track diary app is so necessary for them and promise a result if they will use our application. For instance, you give a promise that after two weeks a person would feel much better if he or she uses the app at least once a day. Or that using your app a person would be in a very good mood all day if he or she follows the instruction in the app. But bear in mind, if you give such promises you have to keep them and do all your best to provide a user with the best service. As well as that, make sure a customer sees the results of his hard work. Show statistical data, make presentations and draw graphics to demonstrate users achievements. All sorts of challenges especially if they require a user to involve his or her friends or even strangers would fit the purpose perfectly. People like to compete even if when they don't understand that its a competition. Add social features into your app and set a challenge people can take up. It is fun and works as advertisement. If you did everything correctly, showed customers a goal and explained the rules you have to promise a reward for their efforts. Especially if there are elements of a competition in your application. It can be anything. Users could earn points to open additional features or get a premium account for free. Almost all of these tips are connected to the topic of gamification. Gamification is an amazing way to engage users and make them regular customers and loyal fans of an application. Before you understand what thing will catch your customers you need to check your competitors apps, find the best free mood tracker apps and try to use them. Modern mood tracking applications offer a wide range of various services. Yet they are still not perfect. It gives you a chance create a better application and poach the customers. Download mood tracking applications, use them for a while, choose the best and think what it doesnt have. If you want to build an app that is compatible with wearables, we would suggest you draw your attention to the IoT technologies and devices. Smart houses can lead your project to the new level. BeyondVerbal is a company that helps analyse emotions analyzing vocal intonations. The company provides an API which can be used for an application to improve emotion recognition feature. PIP company produces small devices which you need to touch with your thumb. These appliances analyze your skin and detect the level of stress. IoT mood trackers are not a fantasy, they are the reality which we already have. And its only the beginning. In a few years, modern devices would detect our mood even without bothering us. These devices would track the mood of people in the shops, offices, theatres cinemas and other places to understand customers preferences and predict critical situations (in prison, for example). 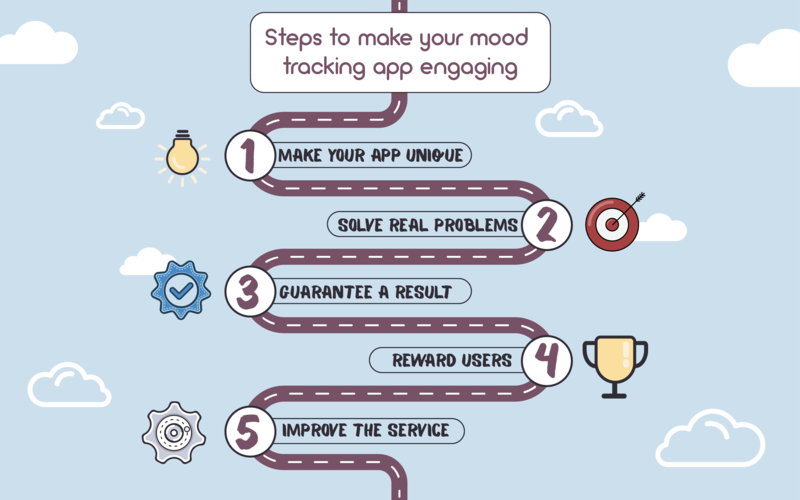 Mood tracking applications are relatively new and they havent reached the peak of popularity yet. And as weve already pointed out (more than once) the most important here is to think through the strategy to retain users for a long period of time. Here, at Cleveroad we believe that well-considered approach combined with the latest technical innovations is that combination which can guarantee the long life of your product. If you agree with all mentioned above, contact us to share your idea.